You are here: Home / Grooming / Keeping in apple-pie order! There is no thumb rule when it comes to the frequency of bathing your dog as it depends not only on his breed but also on individual dog! Bathing your dog is a vital step towards responsible pet parenting. 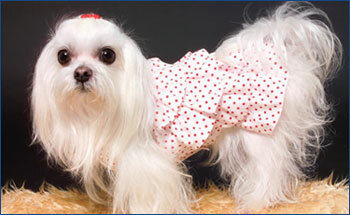 Regardless of the breed and the coat type, shampooing promotes cleanliness and a healthy skin and coat. Routine baths – a must: Dogs do require routine baths to stay clean and healthy. But most dogs do not require frequent bathing – just once a month or less – but brushing in between bath times helps keep them clean, removing dead hair, dirt and debris from the coat. Look for doggy odour: How often you should bathe your dog depends on your dog, his activity level and breed. The best way to tell if your dog needs a bath is through your nose – if your dog has that “doggy odour”, then it’s definitely time for a bath. Depends on the breed: Some breeds are prone to oily skin, such as Cocker Spaniels and Shih-Tzus. These dogs may require a bath every 2-4 weeks, while thick coated dogs like Chow Chow and Siberian Huskies may only need a bath few times a year. Why less bathing: Unlike human hair, dog fur is not suitable for constant bathing and repeated washing will strip the skin of its natural oils. The loss of these oils can cause your dog to scratch and cause irritation to the skin, etc. Doggy shampoos – a must: Dog skin is more sensitive than human skin and using shampoos designed for people can cause a pH imbalance in the skin, leading to excessive dryness. Thus, only dog specific shampoos should be used for bathing your dog. Bathing for treatment: There are some cases when your dog may need a bath every few days for a time, such as for treatment of skin infection, frequent infections and other skin and coat problems. Your vet may prescribe a medicated shampoo, designed to help combat the underlying skin problem. Bathing for swimmers: Dogs who swim in pools and lakes should be bathed thoroughly after every swim as the chlorine and the salt water are highly irritating if left on the coat. Thus, bathing is a valuable tool to keep your pet healthy and when done correctly can help your pet lead a long and happy life. http://www.dogsandpupsmagazine.com/wp-content/uploads/2010/01/grooming1.jpg 134 250 Dogs and pups Magazine http://www.dogsandpupsmagazine.com/wp-content/uploads/2017/05/1254nal.jpg Dogs and pups Magazine2010-01-20 00:00:002014-02-07 17:48:59Keeping in apple-pie order!